I think fall is my favorite time of year to visit the farmer's market. Sure, we all know I love a good tomato, maybe even on a level that could be considered dangerous. But there's something about walking through the stands and stalls where there's a slight crispness to the air, just the earliest hint of cold weather coming, while perusing the folding tables overflowing with delicatas, acorn squashes and butternuts. 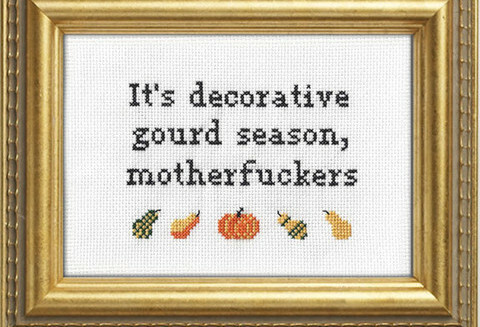 Sure, I like a nice decorative gourd as much as the next girl, but talk to me about the varieties you can roast and sauté and I am more than ready to welcome the change in season with open, squash-filled arms. First preheat your oven to 350 degrees. 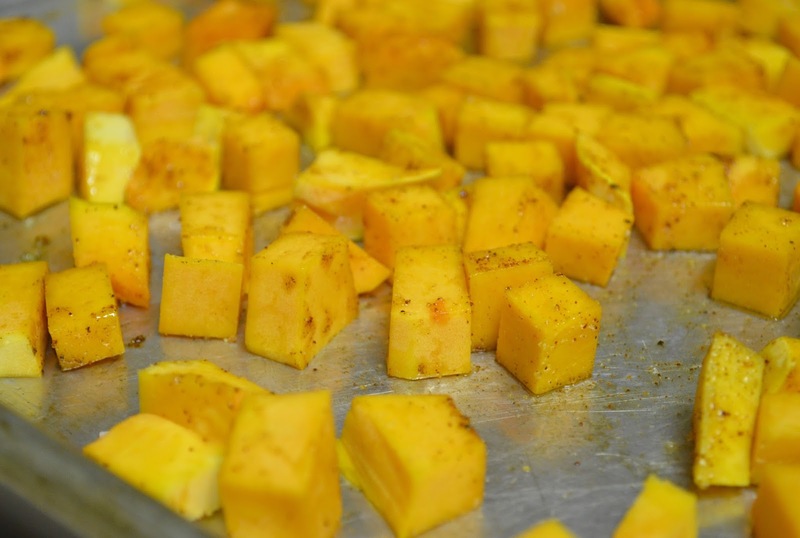 Place your butternut squash on a large baking sheet. Drizzle with olive oil and sprinkle with salt, pepper, paprika and cinnamon. Roast for about 20-30 minutes or until slightly browned at the edges, which will just about be the duration of the risotto-making process. Thoroughly heat your stock in a small saucepan. It's important to start with hot vegetable stock, rather than refrigerated or even room temperature, as this will affect the way the rice cooks. In a separate larger pot, add a tablespoon or two of olive oil. 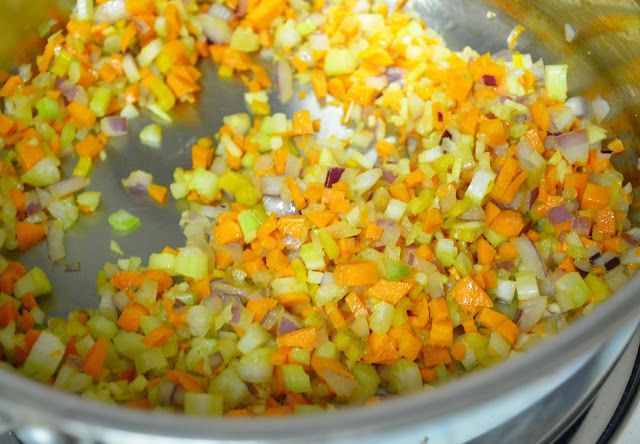 Add your chopped vegetables and garlic and stir constantly, so as to fry but not brown. For the correct risotto texture, the smaller you can chop your vegetables, the better. 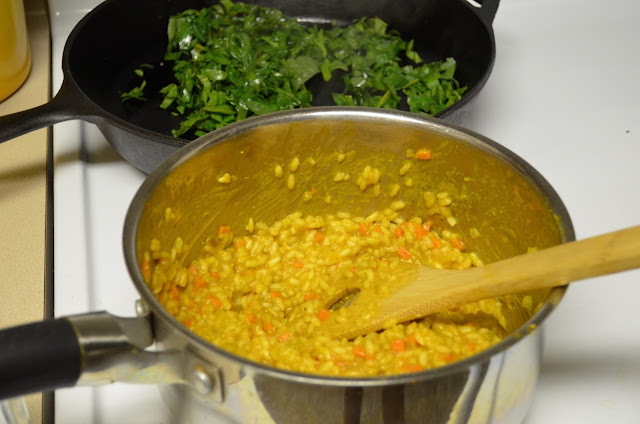 After about 10 minutes or until your vegetables have begun to soften, add your rice. Keep stirring and wait until you notice the rice going slightly translucent around the edges while staying white in the very center. This will happen relatively quickly. Add some salt and pepper. After about 2-3 minutes more, add your pumpkin purée. No one will judge you for using the jarred stuff (well), but as I feel in almost all scenarios: making and using your own will always win in the what-tastes-better department. Stir rapidly to incorporate. At this point it's time to slowly add your stock and stir like a madwoman (or man, or person). Add a ladleful at a time, allowing each addition to be fully absorbed by the rice before adding more liquid. Though the stock will disappear into the rice relatively quickly each time, it's important to keep stirring as to avoid sticking or burning. This is the part that becomes time-consuming. Once you've used most of your stock, have a taste: the rice should be al dente, or still retain a slight bite or chewiness, while the stock lends a creaminess. That's exactly what risotto should be like. If you still find the rice to be slightly too crunchy, add more stock until you've achieved your desired texture. Stir in your vegan butter. 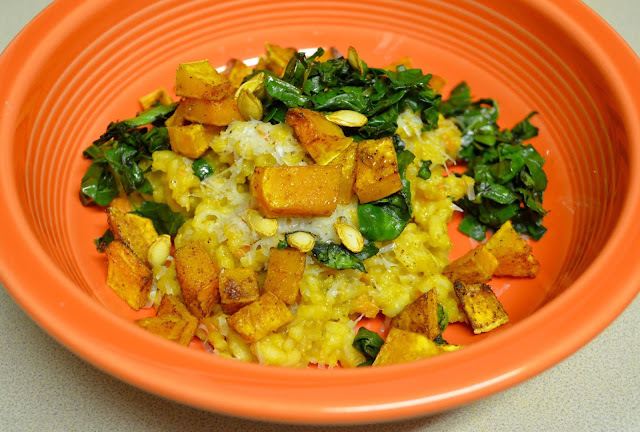 For our risotto, I waited to add cheese to only mine. If you're planning on adding cheese to the whole lot, now's the perfect time to do so. 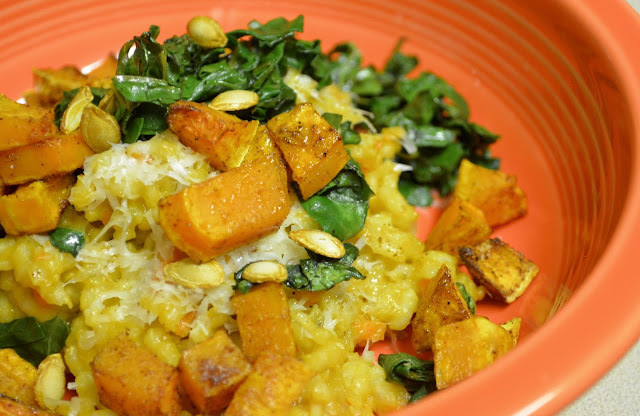 Serve topped with your roasted squash and some sautéd greens and toasted seeds, if you like. This recipe also works great with green peas or caramelized onions. Enjoy! Think there's more than one way to peel a butternut? Try roasted slices of it on this pizza with arugula and walnut-garlic pesto. For taco night, pair with black beans and apple ginger slaw. And for brunch or any lazy morning, try these spiced butternut scones with cinnamon glaze.